This is about restoring an old abandoned rural backyard. Several months ago, we had to relocate due to a job. In this economy, you often don’t have a choice. The job we relocated for was a blessing but it took us several months to find the right home. The one we found is incredible. It’s out at the end of a rural backyard road, and it has about twenty fruit trees, a grape arbor, blackberries, tons of foraging, and acres of woods. When you have a relatively new property, there is lots of potential. You can plant things where you want to, clear out what you want to, leave the woods alone where you want to, find the perfect spot for this or that, and so on. Oftentimes, when people decide they want the rural lifestyle, they end up with a place they can do whatever they want with. However, sometimes it doesn’t happen that way. When you move to a home that already HAS all those things, it can pose an issue. Especially if the people who initially developed the property had no interest in vegetable gardening. We are renting. We had no desire to commit to buying a home since the ultimate goal is to be able to live on the property we already have. All in all, though, this can create opportunities. Make lemonade from lemons, right? Know that wherever you live, there may be some obstacles that you will have to think creatively to work around. The nice thing is it will give you a lot of great experience, regardless if you plan on staying there forever or if it is just temporary. No good place for a vegetable garden because the tree canopy is too tall. Not much direct sun gets into the yard. There hasn’t been much maintenance done in the last few years. This means I have an orchard with twenty fruit trees that really need pruning. 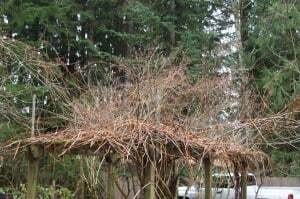 There’s a grape arbor that is so overgrown, it is trying to take over the neighboring trees. And there’s a lost patch of blackberries that was abandoned years ago that needs to be restored. This also means a significant amount of my vegetable growing will be in containers this year, placed carefully in spots here and there that get enough sun. But you know what? It’s exciting to have the opportunity to do this. There will be lots of very valuable experience in rural living and lifestyle to be gained from this, even though it may take several years. I hope you’ll follow along with me on this journey, and I will post photos of my progress along the way. In the meantime, here are some “before” pictures to show you what I mean. 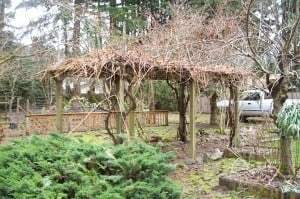 Here is the beautiful old grape arbor. There are a few remnants of the tiny, sour grapes it produced this fall. I am hoping with some heavy-handed pruning, it will produce some good fruit. You can see it is trying really hard to take over the trees next to it! There are two, 20-foot rows of domesticated blackberries that are completely lost. They need to get new posts and wire re-strung. The good news for rural living is, we’ll probably end up with lots of blackberry starts to give away and to replant. Depending on the size of your property and what you want to do with it, you may be considering fencing. Fences in the country aren’t necessarily to keep people away and to provide privacy like in the city and suburbs. Rural fencing usually has a functional purpose. In fact, any improvement made to a rural property usually has a clear functional basis. After you make a master plan for your lot, you can decide if fencing will be among your goals. Before you buy fencing or do anything, you must define a project area first. Our former property was an old homestead that had no structures or real improvements on the property. Over a hundred years ago, the European immigrants homesteaded here. We had purchased it from the descendants. It is from this home that we moved onto our current rental property. We mention it because at that property we were able to improve the backyard with fencing. It was nearly four acres. While we didn’t have money or even the need to fence in all of the acreage, we planned for our garden, small livestock, and a greenhouse as well as our utility buildings and our home. We decided to fence that area. It made the most sense to define the space that would serve as our core area. Originally, our reason for fencing it was to create boundaries for our livestock guardian dogs and prevent them from expanding their territory too far. We were able to see where former owners cleared a large pasture. Some fence corners were still standing with barbed wire. They established an orchard many decades ago. 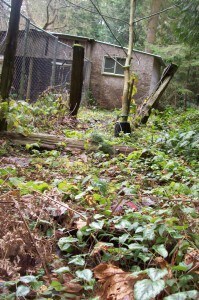 Barely visible under brush and brambles, a crumbled house foundation indicated where a home once stood. But other than that, it was pretty much a blank slate. The property was a large piece and planning what to do with it was a bit overwhelming. Where could we start making this ours? Building a fence to define the space made a huge impact. The fence served another purpose just as important and valuable. It helped us to stay focused on what was important and what wasn’t. We had an area defined by fencing. For a large piece of rural property, it made working on the homestead much more manageable. We were able to better prioritize our goals. While we still had smaller projects going on other parts of our property, most of our time and energy was spent on the area within the fences. Being able to properly prioritize is a huge benefit to one’s sanity! I wonder if our forefathers knew that secret when they fenced small areas many years ago. 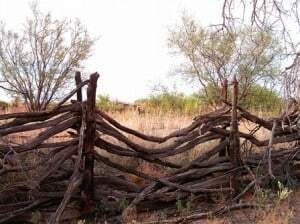 While this isn’t specifically a “how to” post for fencing, it is one to encourage you to plan and build one for yourself if you don’t already have one. Typically, fences “multi-task” by keeping some things in and some things out. What do you want to keep in or out? This will help you determine the kind of fence you do and don’t want to build. For us, a primary reason for our perimeter fence was to keep our livestock guardian dogs enclosed so they will patrol and watch over the important core homestead area without wandering away. We also wanted a physical barrier to keep predators and deer out. We were planning on building fences to enclose hogs, chickens, cattle, and possibly horses. But during the planning stages is when we were considering the move. This depends primarily on function. What you want it to do? But certainly the cost of the fence is also a major factor. I would never recommend downgrading the type or quality of the fence you build due to cost. Instead, reduce the amount you fence at a time by doing the work in affordable phases. This is used mostly to fence larger animals into a large area, as the cost per foot of the overall fence is very reasonable. Barbed wire should not be used for horses; they tend to lean into fences and can injure themselves. Cattle, on the other hand, are not as likely to push into fences. 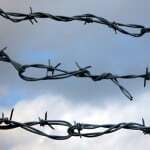 See closeup photo of barbed wire above. This is a very popular kind of fencing that comes in various strength, mesh sizes, and height options. For our perimeter fence, we used a 48″ high heavier duty/smaller gauge fence that had smaller openings at the bottom than at the top. We used wooden corner posts to anchor the fence, with metal T posts at 8′ centers or so. I like this fence a lot. It is very functional and it’s attractive in our rural setting. It will last a long, long time as well. Cost-wise it is a bit more expensive than most options, but we saw it as a very long term investment in our homestead. I experimented with this type of fence to see if I was going to use it for my larger fields. It is a very good concept, flexible and fairly economical. It has the potential to be my fence of the future. High tensile fencing is constructed by setting strong corner post assemblies in the ground and attaching strands of high tensile steel wire between them. Line posts are spaced 25-50′ apart, substantially farther than posts for wire mesh fencing. 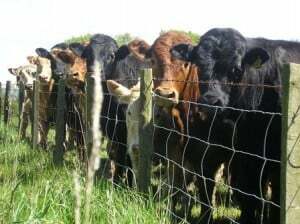 This type of fence can have any number of wire strands, including just a single strand that contains cattle very effectively. I have seen different farms using various numbers of strands depending on the purpose of the fence. A property perimeter might have 5 or 6 strands, while a cattle paddock may have 2 or 3. This makes the fencing system very flexible for many uses. Create tension using springs. I have seen in video where something like a tree falls on the fence. The wire strands do not stretch. After the tree is removed, the spring tension returns the fencing to its original shape. One final great benefit of this fence is that some or all of the strands can easily be electrified. For a photo of high tensile fencing, click here. This looks to be a great option for a very flexible and portable fence. I’ve seen photographs of these fences containing all sorts of small livestock. The fencing comes in 100′ or 150 ‘ rolls. You will be able to roll and move the fence. 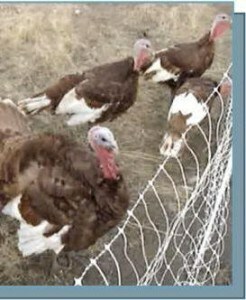 The netting is designed to be electrified. People use this for hogs and chickens as well as other animals. Once you’ve decided what type of fencing to build, use some large stakes to mark out your fence lines. Plan for a wooden post at each corner and at any point where there is a change in direction. If you have a “valley” or a hill” in the fence line, be sure to put a wooden post at either the bottom or the top of each slope. Measure for fencing and calculate the number of wood and metal posts you’ll need. Then go shopping. Be sure to choose treated and solid wooden posts. I select mine by hand. Take the time to properly define a project area with fencing so you can do it right the first time. Working on your rural backyard and property can be overwhelming. However, starting small with a plan can make it much more doable. Start with the existing areas. What’s already established? What do you want to keep and improve or expand on? Consider fencing an area of your rural backyard to create defined space and to protect from predators. Any improvements you make to your rural backyard will further add to your homesteading experience. Have projects ready depending on the time you have. Save the smaller, easier jobs for when you have an hour or less. Have other projects in mind for when you have several uninterrupted hours in an afternoon or an entire day free. As you make your plan, consider trees, sunlight, and drainage. You will also need to pay attention to how level the property area is so that you can do what you want to do in the correct areas. Other factors to consider are neighbors. Depending on if you plan to grow vegetables, have animals, or want open space, it’s essential to start with a master plan. After you make a plan for your lot — even if it’s a five or 10 year plan because of costs — start with one area and build from there.